Moreover, for once in the world of cutting-edge gadgets, a company has surprised us by coming up with the goods for sale early - the world’s first BD video camera will go on sale in Japan on August 30. Overseas sales will start in October. 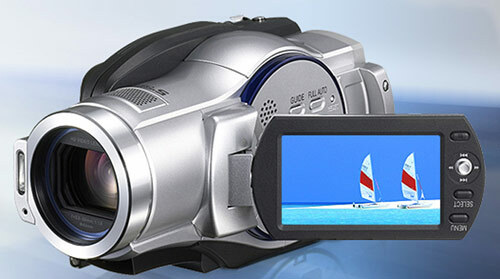 In fact, there are two camcorders due out - the DZ-BD70 and DZ-BD7H. The former costs ¥160,000 ($1,300) and records only to 8cm Blu-ray discs, while the latter is ¥190,000 (£1,600) and also includes a 30GB hard drive. The HDD version is more likely to succeed, as it can hold four hours of 1920 x 1080i high-definition video, whereas the 7.5GB single-layer BD-R/RE discs manage just a quarter of that. A lower resolution of 1440 x 1080i is available, which pushes those times up to eight hours and two hours respectively. Software in the cameras allows for scene selection that approximates to a rough kind of editing and for dubbing the results to the hard drive in the case of the BD7H. However, dubbing is only 2x, so an hour of HD TV takes 30 minutes to copy. Otherwise, the specs are pretty much what we already knew - both models have a 5.3-megapixel sensor that delivers the equivalent of 2.07 megapixels for video and 4.32 megapixels for still shots, have a 10x optical zoom lens and a 2.7-inch fold-out LCD monitor. Both cameras have similar battery expectancies, with the BD7H’s 100 minutes just beating the 90 minutes of the BD70. The hard drive model is also slightly heavier at 630g, compared to 575g. Given the inevitably that other manufacturers will produce both Blu-ray and HD DVD camcorders soon, we can safely expect these two groundbreakers to be the first of many. The question remains, however, of what will happen to AVCHD?